Cook the toor dhal along with turmeric powder and asafoetida. Yummy dish! I love the smoked flavour & I like the way you have added lentils in your preparations. I live how clear the pictures look...very nice combination..
wow! looks too good! can I hv some with my idli or rice? Such a popular dish, love gothsu with crispy dosas,my fav combo anytime. Awesome ya. We consume a lot of eggplant. I make gothsu all the time for pongal too. Will try your version. I already love it. சிதம்பரம் கொத்சு ரெசிபியை தான் தேடிட்டிருந்தேன்,நிச்சயம் செய்து பார்க்கனும்....அருமையா இருக்கு!! Good one. My mom makes this very often but owing to allergies I don't cook with brinjal! Good one....a different and new dish for me. சுட்ட கத்தரிக்காய் கூட பருப்பு சேர்த்து செய்ததில்லை, நல்லா இருக்கு ஷைலஜா! Haven't tried this by smoked eggplant. Hope tastes great. your photos are amazing - I don't even like eggplant and you make me wish I had a spoon to dig into that bowl! 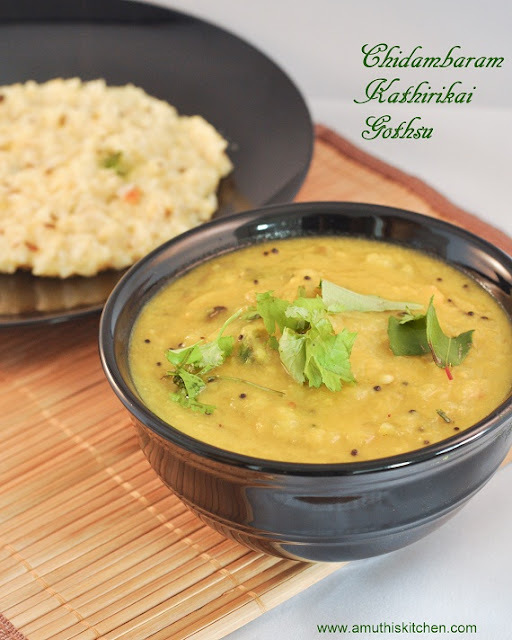 pongal and kathirikkai gothsu are made for each other.. delicious preparation.. Delicious looking gothsu.. Love it! Wow! Brinjal and dal... Who knew?! Looks so yummy. Am definitely making this.